Royal Mail will issue individual and team stamps for ParalympicGB gold medallists at this month's Games within five working days of their success. Postboxes in the home towns of gold medal winning athletes will also be painted to honour their achievements. "Royal Mail should be congratulated for making the right decision," said shadow Olympics minister Dame Tessa Jowell. Royal Mail had said it would issue six first-class stamps showing groups of winners but not for several weeks. Dame Tessa had written to Royal Mail's chief executive and said she was delighted the decision had been reconsidered. "The stamps for Team GB's gold medallists have been such an emblematic part of our celebrations during the (Olympic) Games. I am delighted that our Paralympic heroes will be given the same honour." Royal Mail said that because of public demand it would now issue the individual stamps, albeit within five days and not overnight as they had during the Olympics. "We believe this is the right thing to do," said Andrew Hammond, Managing Director, Royal Mail Stamps. Image caption Dame Tessa Jowell: "Right decision"
"Following the great success of Team GB at the Olympics, the popularity of Royal Mail's Gold Medal stamps and the way in which our gold postboxes have captured the public imagination, we have decided to commemorate ParalympicsGB's achievements in the same way," he added. "Just as our Olympians outperformed expectations, we are confident that our Paralympians will also outperform. "This is a huge logistical challenge and we will get the gold medal stamps for sale as quickly as possible." In the letter to Royal Mail, dated 15 August, Dame Tessa asked the company to reconsider its plans. "From the moment that London won the right to host the Olympics and Paralympics in Singapore, we were always determined to ensure that they would be one vision and one Games," she said. "The people of this country have demonstrated their enthusiasm for the Paralympics through record ticket sales and the prospect of the first ever sell-out Games." 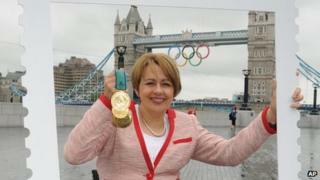 Dame Tessa went on to say it would be "a shame" if the Paralympians were not offered the same honour as the Team GB athletes. The stamps will be released within five working days of each gold medal win, rather then overnight as the London 2012 ones were. Originally Royal Mail said that because of the large number of gold medals expected to be won at the Games it was "logistically and practically impossible" to produce an individual stamp for all the gold medallists. It will be the first time ever Royal Mail has issued gold medal stamps for ParalympicGB winners since the movement was founded in 1948. The move has been welcomed by the British Paralympic Association. "We are delighted that the offer has been increased and thank Royal Mail for reconsidering this proposal," said Tim Hollingsworth, chief executive officer. "We hope that the whole nation will continue their support of British athletes and cheer us on to many gold medals." The Paralympics were founded at Stoke Mandeville Hospital by Dr Ludwig Guttmann. The stamps will be on sale at 518 Post Offices across the UK and will be rolled out to a further 5,000 branches. They will be presented for purchase as a sheet of two First Class stamps for £1.20 and will include additional information on the winning athlete or athletes. Royal Mail said the main image of the stamp will, wherever possible, be a photograph of the ParalympicsGB athlete or team from their gold medal winning journey or following their win. During the Olympic Games, 29 gold medal stamps were issued, as well as four stamps for the 1948 Games bearing the five Olympic Rings. This summer, around 4,200 athletes from 160 countries are expected to attend the Paralympic Games, with 471 medal events on the programme spread across 21 sports. At the Beijing 2008 Paralympic Games, ParalympicsGB won 42 gold medals. This year, in support of ParalympicsGB, Royal Mail donated £200,000 to the British Paralympics Association, which will be shared equally among all ParalympicsGB gold medallists.